Explained the need to keep tooth and get root canal instead of extraction. Learned a lot...very professional and kind. I was very satisfied with his evaluation of my teeth. His mannerisms were very comforting and professional. I would recommendhim to anyone. His staff were all very kind and welcoming. Overall I was extremely pleased with my first visit at this facility. I was very satisfied with his evaluation of my teeth. His mannerisms were very comforting and professional. I would recommend him to anyone. His staff were all very kind and welcoming.Overall I was extremely pleased with my first visit at this facility. Dr. Patel is a graduate of Creighton University in Nebraska, one of the top dental schools in the world. Born and raised in the United Kingdom Dr. Patel moved to the US in 1997. He spent 8 years at Creighton University, receiving his undergraduate and DDS degrees there. Since graduation Dr. Patel got married and moved to Mesa where he currently resides. 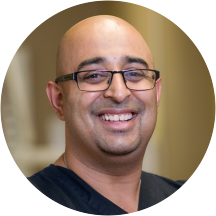 Dr. Patel continuously furthers his education by attending seminars and courses to give his patients the most advanced care available. In his spare time he enjoys spending time with family, traveling and soccer. Dr. Patel and his s entire staff are great. I would recommend them to everyone. Dr. Patel had a very good bedside manner and all of his staff were very friendly. I felt very comfortable and would recommend him to anyone. This office was very friendly and made me feel comfortable. Loved the professionalism! Dr Patel was amazing both during and after my visit. Had some concerns after my appointment and Dr Patel reached out multiple times via txt/call to make sure everything was ok several hours after I left the office! I came in with a really bad toothache. I was sleeping happy to be seen only to get shots that made it worse. All they did was say sorry. Just moved to the area and needed a dentist, quick! I was very impressed with the entire experience. . .and I don't like dentists. I think I have found my new dentist. Dr Patel and his staff were all very friendly and professional. I appreciated the honesty about the dental work I need; they helped me to figure out which issues are a priority and which ones can wait. They also figured outthe best way to maximize my insurance. It was a great experience. Dr. Patel was kind, knowledgeable and gentle! He guided me through the entire process and was able to start the work the day of the appointment. He will definitely be my dentist from now on! I've always had really bad anxiety when going to dentist. I've had an issue with my front tooth I put off for 4 years (2 visits to 2 different dental offices) because I just didn't feel comfortable. Not only did Ifeel SUPER comfortable with Dr. Patel and his assistant, but I was in and out within 45 minutes with the problem fixed. I can confidently say I'm going to continue to visit his dentistry until any/all dental problems are totally fixed. Never been able to say that before! If you're like me and just can't find the right dentist, look no further!! Great visit very honest doctor everyone there makes you feel very welcome. Dr. Patel was very friendly, informative and helpful. I would definitely recommend him to friends and family. This was my first time at the doctor office and they were great. I appreciate being informed about everything that was going to be done and recommendation made. The doctor was very professional and answered all my questions. Best dentist ever! I am really not comfortable going to the dentist, and they made me feel so comfortable. Thanks so much! Absolutely fantastic!! Dr Patel and his entire staff were great, friendly and professional. Dr Patel took great care of me and his office called the next day to check on me. Highly recommended!! Great Dr, friendly staff. Most of all very quick with services and almost no wait time. Great people, don't care for the office, old equipment and such but hey, the people were awesome, Dr is great, assistants equally so.